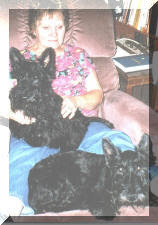 Montgomerie of Camas - AKC Scottish Terriers: "Bryn"
Bryn in my arms, with Dan at my feet. 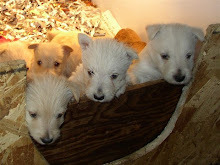 She was a life long companion of her mate Dan and they had 54 puppies together. Bryn was a great mother, loved to go to the Snake River yearly campout where she was a fierce & dedicated hunter of varmints. We loved her dearly & she will be missed in our Scottie family.